This is a quick fun project to get a festival look without busting the budget. 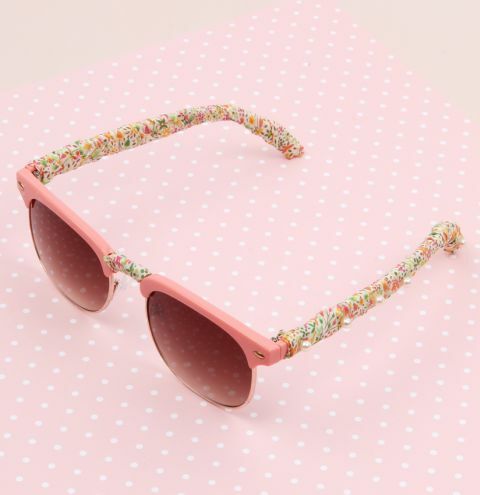 Liven up an old pair of sunglasses or give a cheap pair an individual look.....have fun. Line up your ribbon with the very end of the glasses arm (ear end, on the inside) and use a small amount of glue to secure it. Wrap the ribbon around the arm ensuring that there are no gaps. When the arm is covered use a small amount of glue to secure the loose end of the ribbon (aim for the inside of the arm for the best finish). Repeat the process with the second arm. Put a small amount of glue on the inside of the bridge of the sunglass, attached the ribbon and wrap it around, trim and secure with more glue. To finish the look I have added Swarovski pearls to the arms. While it is easy to stitch them on, I went for the even easier option of glueing them in place. Remember when adding embellishments leave the area around the ear clear as it would be really uncomfortable.